With school waiting right around the corner, you may find yourself like other students and parents scrambling to get all of the necessary supplies for move in day to the dorm or apartment. You know your knowledge seeker needs a vacuum for the room and it needs to fall within budget. With so many options available, which machine suits your needs? Let’s take a look. 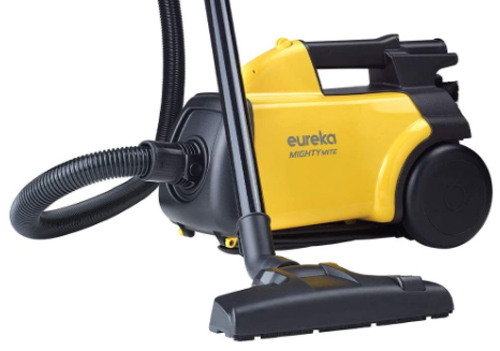 First, we consider the Eureka Mighty Mite canister vacuum. Simply hold the handle of the hose and you can clean floors (including carpet, linoleum, or cement, the popular flooring choices in dorms) and by attaching accessories, your cleaning reach extends to every inch of the room. You can upgrade the Mighty Mite with a True HEPA filter separating the microscopic particles that irritate the respiratory system from exiting the vacuum back into the room. You can have this compact canister vacuum with full amenities for $88.95. Read more about the Eureka Boss Mighty Might here. For lighter clean up jobs and versatility, consider the Eureka Quick Up 2-in-1 Cordless Vacuum 96JZ. A smaller hand vacuum rests inside the full stick body for floor or detail cleaning. Pick up shreds of notebook paper and crumbs for when your date comes over to watch movies on your laptop. When you finish, empty the dust cup and store the vacuum out of sight. You never need to worry about bags. Click to see if the Eureka Quick Up 2-in-1 Cordless Vacuum is right for your room. Maybe you get lucky and your roommate/suitemate already owns a vacuum to clean the floors, but you still need something small and less bulky to clean your own area. Do you need to dust your desk? When was the last time the blinds were vacuumed? You can go to each section of the room and use either the main suction nozzle or use the mini hose and crevice tool to get into the smaller, thinner locations. Could the Eureka Easy Clean Hand Vacuum be the one? During your college years, you grow, learn, and understand new aspects of education and life. Spend less time cleaning and more time studying and making friends and memories thanks to one of these machines. If you feel you need something a little different than these dorm and apartment approved vacuums, call one of our expertly trained associates to help find the right machine for you within your budget. Call today at (866)-972-8227 and check “vacuum” off your back to school list.